The bottom line is this: You can keep your fully dimmable, old-fashioned shape, with frosted glass.... these are just halogen, so they're brighter than incandescent, watt for watt, and therefore more efficient. So you can replace that old 100-watt bulb with a new 72-watt version, you'll be compliant, and you'll help save valuable resources! And did I mention, we have them in stock at Dominion Electric Supply? We do! We are stocking all four wattages, all in frosted. 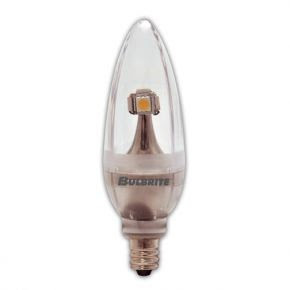 The bottom line: using only 2 watts of power, you get the brightness of about a 15- or 25-watt chandelier bulb. And these lamps will last 35,000 hours! So if you have a hard-to-reach place where bulbs are constantly burning out, these would really be worth a try. I'm giving some to my parents to try in their exterior post light ~ that light is on a photocell, so it's on all night, so I can just imagine how much energy they'll save by switching to LED, and they should not have to change them for years and years! Lastly, we are now stocking their 75-watt G9 loop-base lamp, frosted. 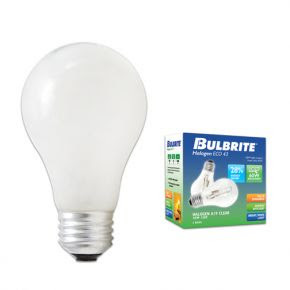 We were having a hard time finding replacements for this bulb in this wattage, but Bulbrite came to our rescue! 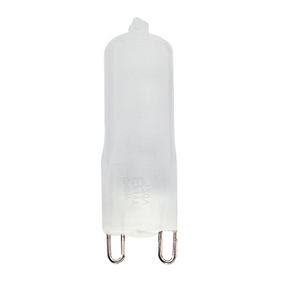 We're seeing this little loop-based halogen lamp being used in bath lighting especially these days. I think the manufacturers are loving it because it's so tiny, so they can use much smaller glass. So now we're ready to replace them once they start burning out! @Bulbrite is at the forefront of educating all of us about the changes ahead, so they are a fabulous resource. I highly recommend you spend some time on their web site. Happy Labor Day to everyone. Dominion Electric Supply will be closed for the holiday weekend and will reopen on Tuesday 9/6 at our normal business hours. Be safe!